[Yes, you’ve likely seen this photo many times, but here’s why.] When you are travelling and you return to a place that you love, do you take photos of your favourite spots again and again and again, even though you already have pictures of that place? I do. And where do I return? To this most beautiful hilltop village in Provence: Gordes. Let me share with you some reasons why I love the town so much and why I believe you will want to visit (and revisit) this Provencal town. Provence. The Vaucluse. The Luberon. When people say they want to visit Provence, they are talking about an enormous area in the south of France. It is actually the administrative region called Provence-Alpes-Côte d’Azur. 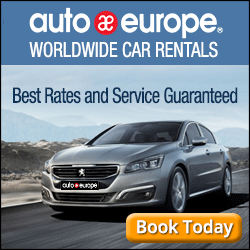 You’ll hear them say, “Provence”, the “Vaucluse”, or the “Luberon”. So which is it? 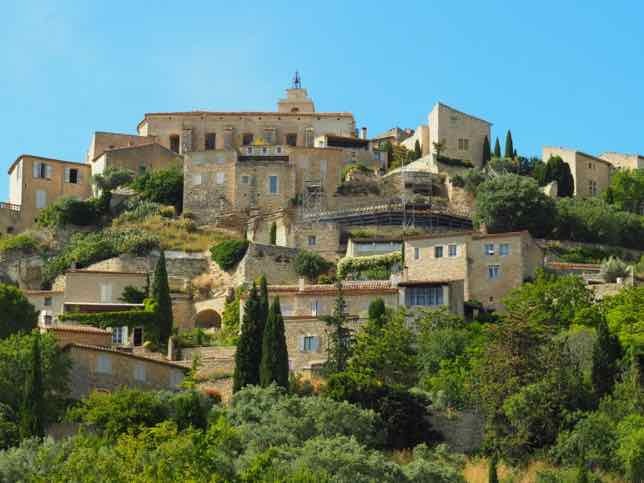 For me, it is the Luberon, which is a massif or group of mountains in the heart of the the Vaucluse department, covering about 600 square kilometres. 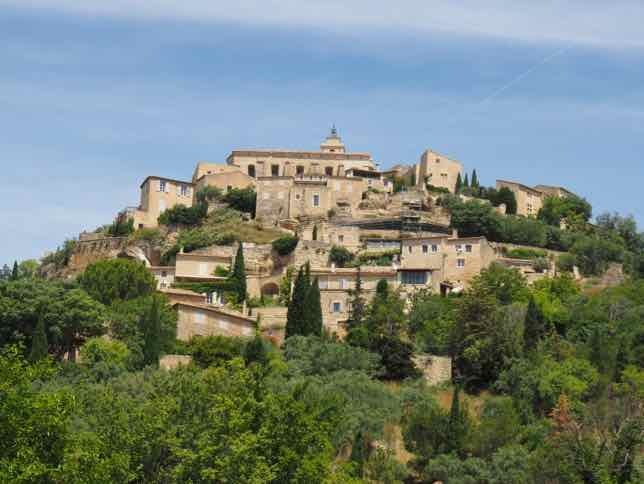 This concentrated area is where you will find many renowned hilltop villages, including Gordes. 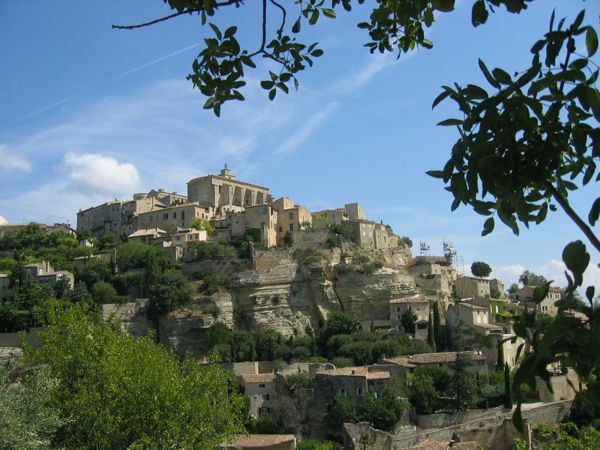 The town of Gordes is also included in this prestigious list for good reason. 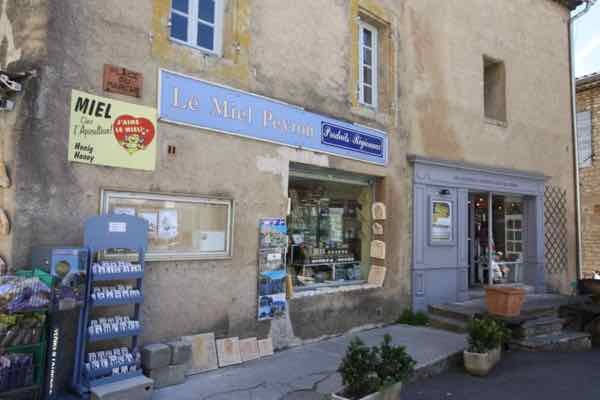 It is a village perched on a hill and everyone who visits Gordes no doubt has a photo of the town as they approach it: where Route de Cavaillon (D15) and Chemin de Gaumaud meet. Photos are taken from this vantage point. (A map is shown at the end of the post). 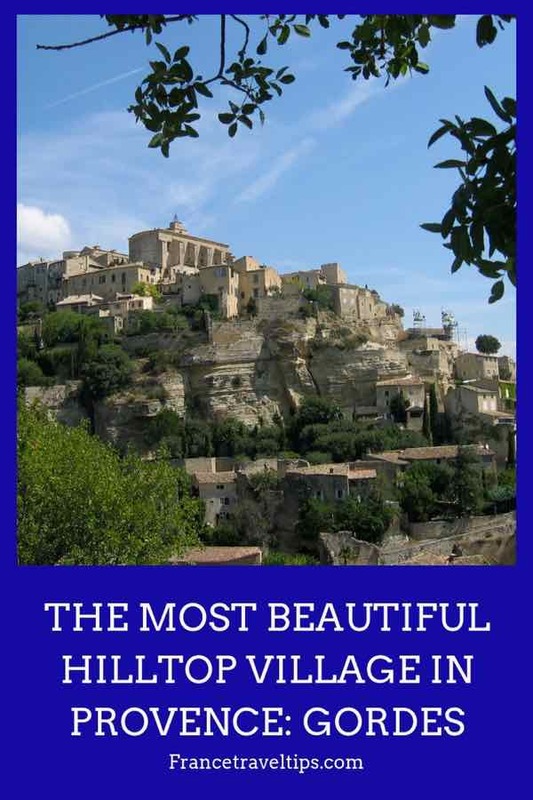 Yes it is, without a doubt, one of the most picturesque towns you’ll see anywhere in Provence, with cobblestone streets, and stunning views of the Luberon valley. Being such a picturesque location, it is not surprising that Gordes has attracted many artists including Marc Chagall and Victor Vasarely. The 11th century medieval Château de Gordes in the centre of town continues to have art exhibits like the one I attended in 1978 where Vasarely had a major display. Vasarely was the grandfather of optical illusion art. 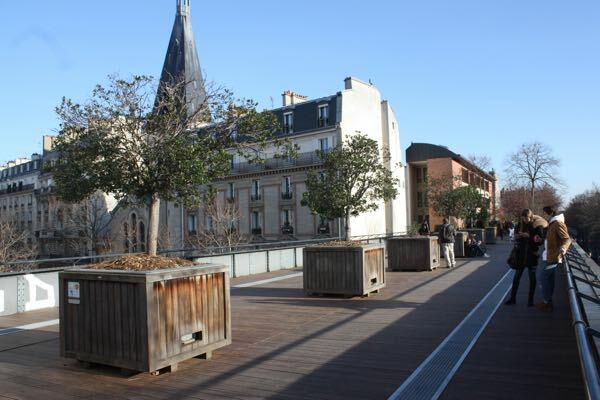 The exhibit remained there until 1996 and was eventually moved to Aix-en-Provence. It is clear now why our family friends decided to purchase a house in Gordes as it was the perfect place for artists and those who love art. Our family friend, Mrs. Quan, worked with Jack Pollock, a successful art dealer in Yorkville, Toronto and together they purchased a home that was built into the town walls. Yes, INTO. It was renovated and when I visited with my family in 1978, there were 9 of us, so it was a pretty big place. All the walls were stone and it was particularly cool, even in August. 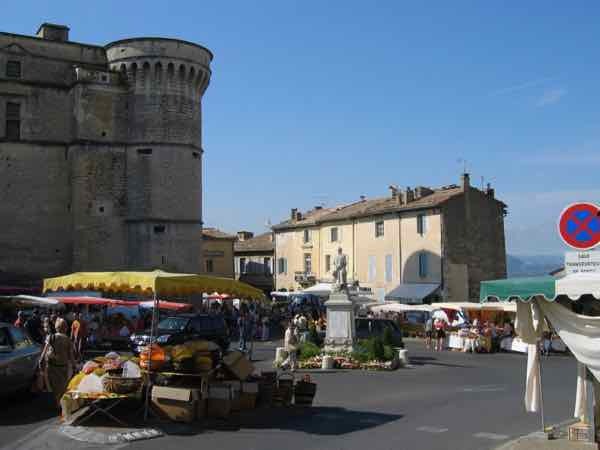 This first visit for me took place well before the town appeared on everyone’s radar screen as “the” place to visit and it was magical for me…..my first exposure to living in Provence where one picks up a baguette from the local bakery and endures the fierce winds of the Mistral in late August. 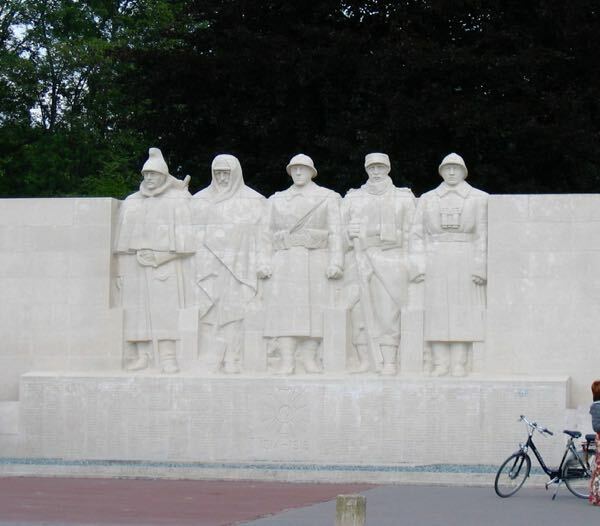 I wrote a thank you post to my father on the occasion of his 90th birthday Dear Dad: Thank You For Taking Me To France. In 1978, the town had not been overrun with tourists. Since then, however, there’s been a lot of development (primarily hotels). 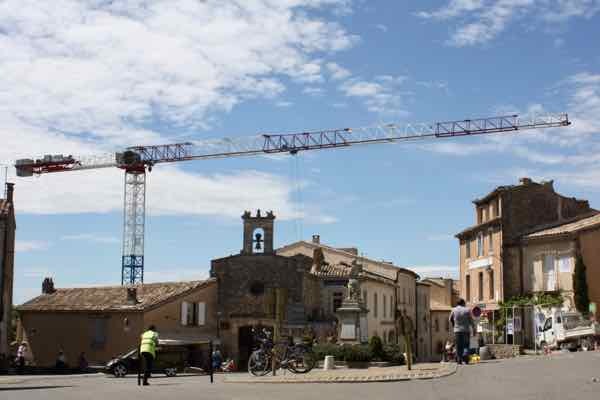 During one visit, there were gigantic cranes in the process of building another hotel. But don’t let that deter you from visiting. Today the town has significantly more hotels, restaurants, and boutiques and a popular weekly market which takes place on Tuesdays. It is a good size, taking up a lot of the main square. There is nothing more pleasant than getting lost in Gordes. There are winding streets and numerous paths that take you up and down the hilltop town. You will be presented with lovely views of the valley and there are spots with benches if you decide you want to have a picnic. I never get sick of walking through the town. There are so many homes built into the hillside and it is not filled to capacity with shops, which makes the visit less hectic. Towns like St. Paul de Vence can be crazy busy due to the all the tourists going in and out of the endless shops. It’s not like that in Gordes. Yes, it can get crowded, but not in the same claustrophobic way. One interesting trek I did was between the Abbey de Senanque and Gordes. I parked at the Senanque Abbey and walked up the hill towards the town, had an ice-cream and then walked back. The entire route was only 6.4 km; however, it was a lovely walk that provided perfect views of the Abbey and the Luberon valley. 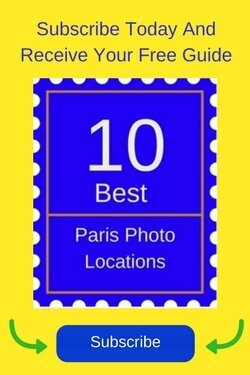 I got the idea from Marcia DeSanctis’ book, 100 Places In France Every Woman Should Go. She walked down from Gordes and before her eyes she saw the Abbey surrounded by lavender. Unfortunately, I was a few weeks early, so I will have to return. As the years go on, there will be more and more tourists visiting but I believe this town will remain the most beautiful hilltop village in Provence. 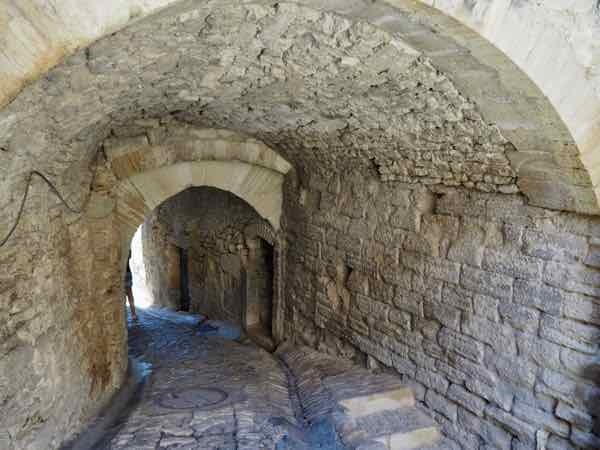 Gordes is a beautiful town and there is so much to see nearby as well, like the abbey and the village of Bories. Plus Roussillon and Menerbes nearby and…oh, I want to go back! It’s pretty hilly. However, it’s still worth visiting if just for the view from the side road or visiting the main town. This is great, Jan! I’ve not been to that tiny little area known as ‘Provence’, so your article helps me to understand where to go and Gordes looks Gorde-geous! I am headed back to Provence next summer. 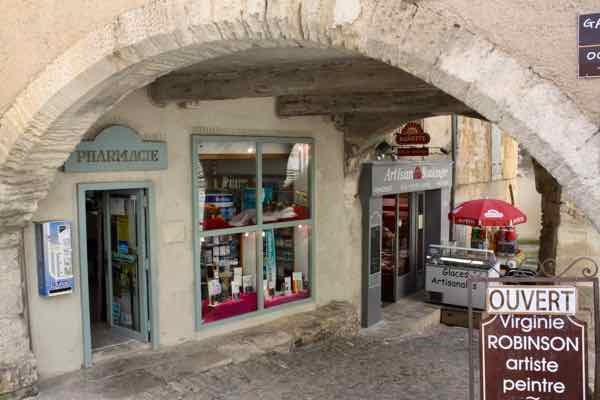 I loved Uzes and Avignon the first time I was there. This time I’m going to Lyon. Gordes sounds like a lovely spot. Will have to add it to my list. Is it closer to Burgundy country? It’s south of Lyon by a couple of hours. Gordes is still closer to Avignon and Uzes but worth visiting. Gordes is beautiful and your pictures are stunning! I take pictures of the same place even though I’ve already got some. You actually see pictures through a different eye. So true. I love taking photos of hilltop villages. Picking out the most beautiful place in Provence is certainly a tough job. But you managed it quite well Jan. I loved the short video. Really gives a sense of the place. Yes, there are so many beautiful places in Provence, but those hilltop villages really stand out and that’s why Gordes is my favourite. Gordes looks beautiful! We’ve passed the Luberon on a drive from France to Switzerland. So many little hilltop villages to see. We definitively have to return! There certainly are so many villages to visit and each one is appealing in its own way. The only part of Provence I’ve been to is the Cote d’Azur (many years ago). I’d love to explore some of the medieval towns in the area. 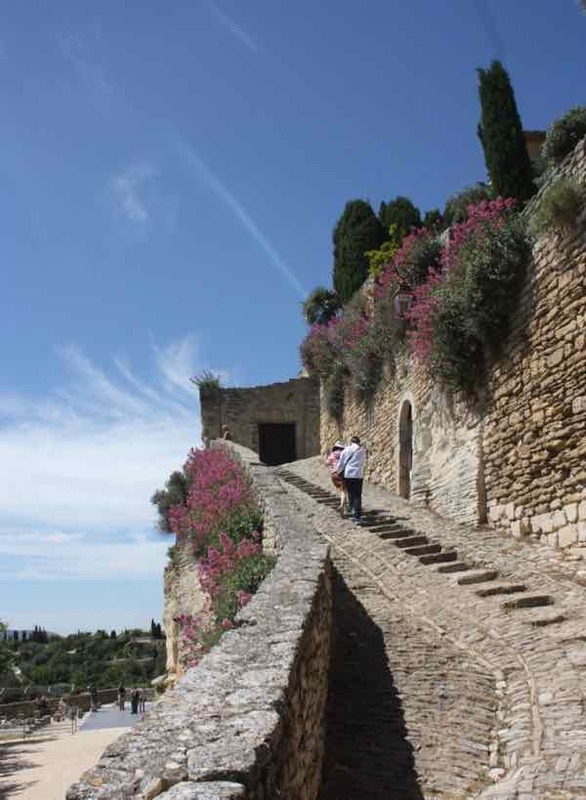 Gordes looks lovely – I really want to do that walk along the old wall! Talking a walk around the whole town is pretty neat. There used to be plaques signifying that the Crusades had gone through but I can’t find them anymore. I can see why you love Gordes so much. I hope I am fortunate enough to get there one day. 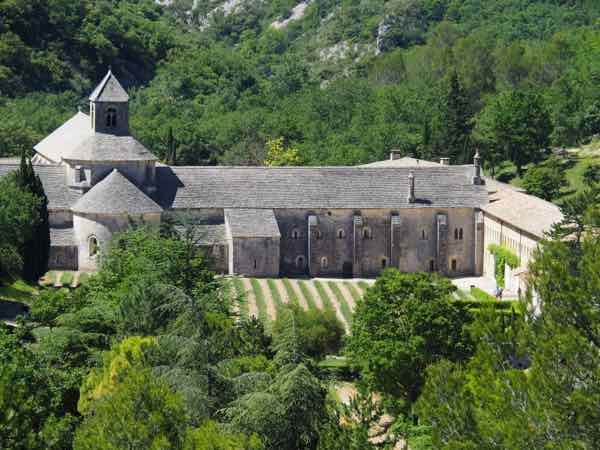 So many lovely places in France to see and yes, Gordes should be near the top of your list! Your photos are beautiful and make me want to pack a bag and hop a train from Portugal. Charming may indeed be an overused word but if you only had one word to describe Gordes, that would be it! I love your picture of the staircase winding up the cobblestoned hilltop with the bougainvillea climbing up the side and I’d love to take a walk to the abbey. With lavender fields surrounding it, the walk would be hard to beat. 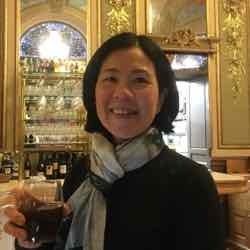 If this was on your itinerary for your first trip to France, I can well understand your fascination and love for the country, Jan! Yes, that first trip is what set the stage for many more visits! Such great memories. I wouldn’t want to miss the beautiful hilltop town of Gordes, and since I am starting to have knee issues, sooner rather than later. 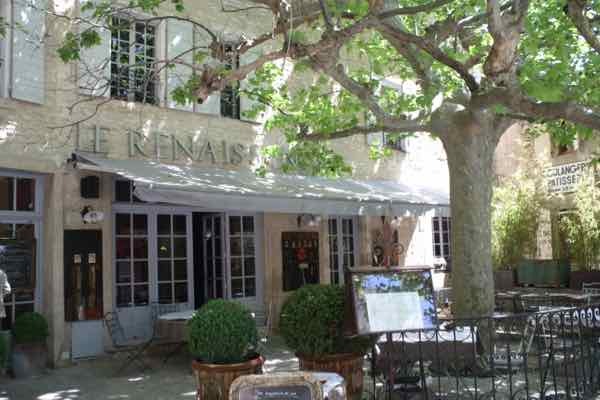 How many days would you suggest with a 10 day trip to Provence? Sorry to hear about your knee issues. You really only need a day to visit Gordes. Not every part is hilly so you can walk around parts of the town. There are also so many more towns in Provence to see and not all of them are hilly (ie. Lourmarin is lovely). Lovely post. There are so many beautiful small towns to visit and I agree with you about Gordes being one of them. St. Paul de Vence used to be a favorite but it has too many bus tours stopping there…you can hardly walk on the sidewalks. I used to love St. Paul de Vence as well. Totally agree it’s now too touristy. Seeing that there was such a heat wave these past few months, hopefully, September will be cooler! Enjoy!